With the Guild War registration phase kick-starting off today, it’s finally time to hop on over to Saint Haven and report to Adventurer’s Guild Master Gunter to sign your guild up in the most electrifying guild competition ever! This is the first phase of every Guild War. Guilds from each world (Westwood, Springwood, Greenwood & Holywood) looking to step into the glorious battle must first register during this period. This phase lasts for only 7 days. To register your guild, you will have to head up over to Saint Haven and report in to Adventurer’s Guild Master Gunther. Upon registration, your guild will automatically be assigned to either the Blue or Red team. A new icon will be displayed next to your character name that will indicate which team your guild has been placed it. *Guilds cannot withdraw their registrations during the Guild War. Please note that the guild member list will be fully locked (meaning no one can join or leave the guild during that time) for the length of the Guild War. Pro Tip: You should register your guild up for the Guild War even if you think your guild is not strong enough to fight in the actual War Phase as every member in your guild can help earn Guild Points during the Selection Phase. Guild Points earned can be converted to Guild Celebration Points which can be used to purchase various items in the Guild War Shop! The second phase is known as the Selection Phase. 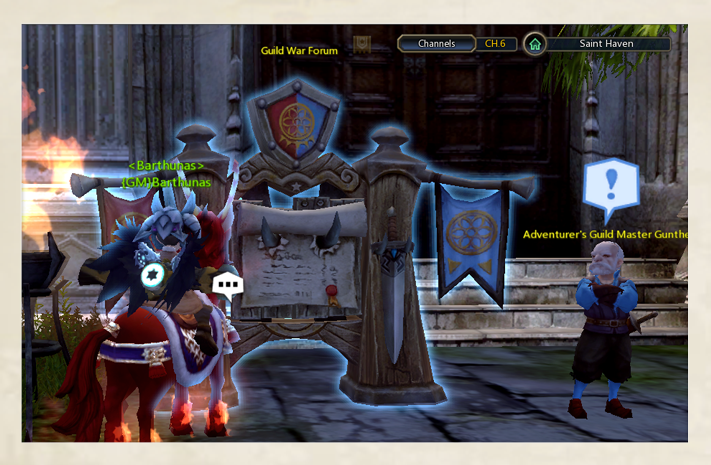 This is where all registered guilds compete to gain Guild Points through completing Guild Achievements. The Top 16 Guilds with the most number of Guild Points attained will move on and advance to the final War Phase. The Selection Phase also lasts for 7 days. To take a look at the Guild Achievements available, simply look at your Achievement Menu which can be accessed by pressing the ‘L’ key. 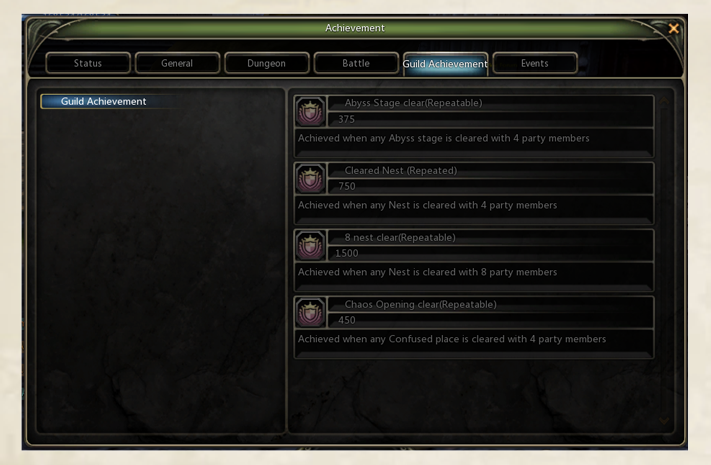 All guild members contribute Guild Points to their guild by completing the Guild Achievements shown above. 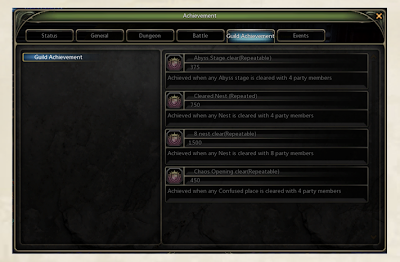 All Guild Achievements are completely repeatable! This is it – crunch time. After working hard to earn all those points to push your guild forward it’s time to finally sound the drums of war and step unto the battlefield with the other top tier guilds that have been doing the exact same. All Guild Points accumulated thus far at the end of the Preliminary Phase will be tabulated and the Top 16 Guilds with the most number of Guild Points will be selected and brought forward to the Final Phase. The results and points accumulated by the selected guilds will be displayed on the Guild War Forum board, located right next to Adventurer’s Guild Master Gunther. The war itself will take place in the Colosseum channel under the Guild War map.